With new support offers and an overhaul to our events programme, 2018 promises to be an exciting year for Big Local areas. In a new partnership, UnLtd, Local Trust and 19 Big Local areas will be working together to accelerate social enterprise and increase local job creation over a three-year co-funded support programme. In this series Matt Leach, chief executive of Local Trust, reflects on what he has learned from Big Local communities during his first year in post – starting with his very first visit to Barnfield Big Local. Margaret Bolton, knowledge and learning curator at Local Trust, outlines some of the ways areas are using art and creativity to benefit their area, following Local Trust’s recent submission to the Calouste Gulbenkian Foundation. David King, innovation lead at Local Trust, outlines how Big Local areas can take the lead in shaping the neighbourhood around them. Ross Miller, Chair of Dover Town Big Local partnership tells us about the community vision for land in his area. During an event in October, representatives from three Big Local areas shared their experiences with fundraising and its impact on the projects in their community. 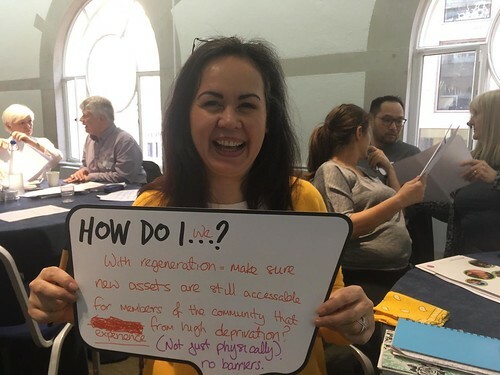 Lea-Anne Clayton from South Bermondsey Big Local reflects on the daily challenges for residents in her area, how she tries to make a difference and her optimism for the future. Read the newsletter to find out which Big Local areas have been in the news, our Video of the Month and how to access funding for Parks in your area.